The Character record type (we’ll assume this is connected to a Book record type). The Character Relation field (using the Relationship Marker data type) to define the type of relationship to another character. The Terms List to use (to define the allowable types of relationships). In this instance, you will be using the standard Family terms list (see also second example below on creating a terms list on the fly). 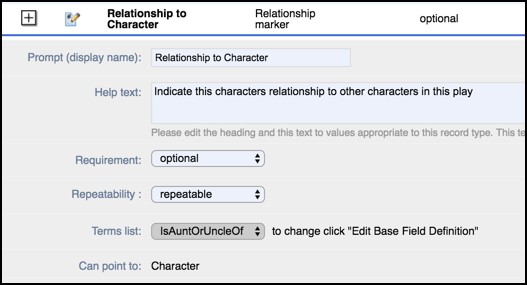 Complete the Define new field type dialog; call the field: ‘Relationship to Character’. Set the Data Type to ‘Relationship Marker’. 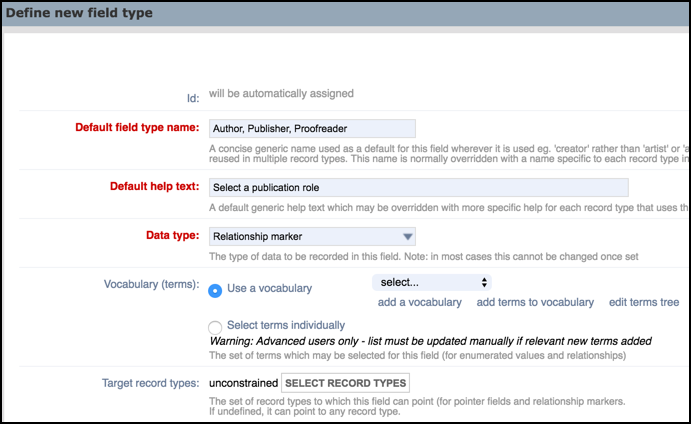 In the Vocabulary (terms) field, select the vocabulary to use as your terms list (this restricts the type of relationships this record can have). In this example, we will use the standard terms list ‘Family’. Note. If you don’t select a particular record type to point to (e.g. 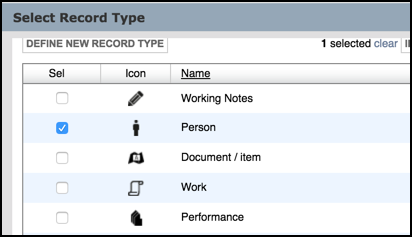 in cases where you don’t know in advance what type of record might be referenced), the pointer field will be ‘Unconstrained’, which means the user can select any record from the pointer field. Note. At this stage you can use Preview to preview the result. You can also add any term missing from your vocabulary using the Add Terms option. Save the new record type. For each character, create a new record of type Character. From the Add Data tab, select Keyboard | Add Record and select the type of record = Character. Click Add Record. 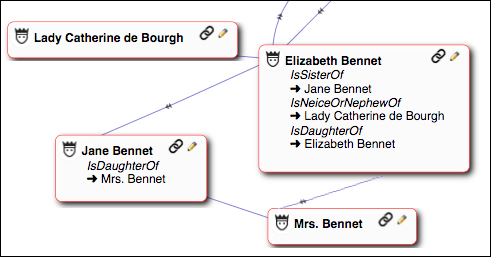 Create the first relation by clicking in the Character Relation field and selecting ‘…is daughter of’. Click in the Target Record field and select ‘Mrs. Bennet’. Note. 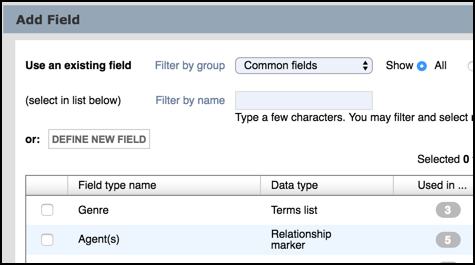 Use the Optional dialog to add any additional relationship details, to be stored in the Relationship record. Click Add Relationship to add the relationship as a new record. You can edit relationships and add additional relationships directly from this view. 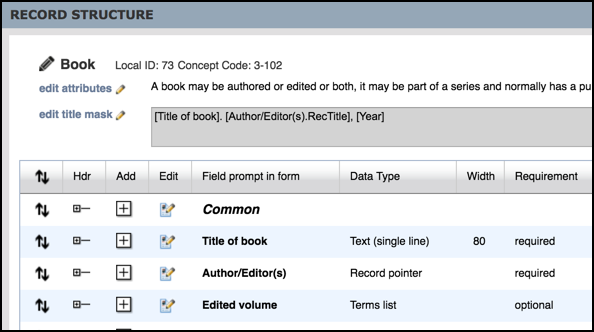 In the following step-by-step example, you will be creating a relationship marker that defines the connection between a book record and one-or-more person records. 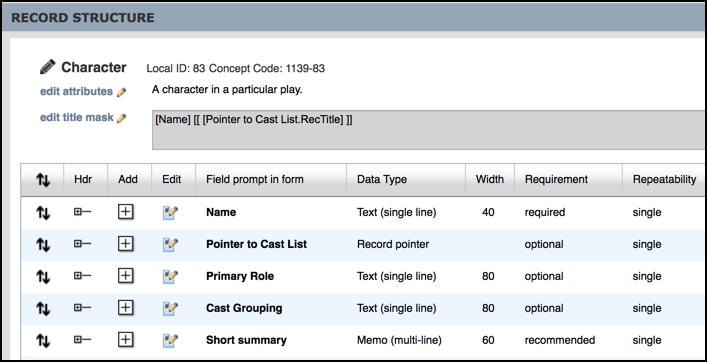 In this instance, you will also be creating the terms list for the relationship marker. Add Author, Publisher and Proofreader as terms (Add Vocabulary button). Now you can create the content that will be used within the module.